29/10/2010, République Togolaise:Nouveau bilan des inondations: 82.767 personnes touchées, dont 21 décès et 85 blessés. The annual West African climate-related crises are among theunder-reported disasters in this world. In the dry Sahel region, communities are periodically affected by food- and nutrition crises; Along the sourthern coastal regions many communities are regularly affected by heavy floods during the rainy season. This blog informs about the latter. Über die jährlich wiederkehrenden Klima-bezogenen Katastrophen in Westafrika wird in den Medien kaum berichtet. Im ariden Sahel leiden jährlich viele Menschen an Nahrungs -und Nährstoffmangel. An der Küste sind es die heftigen Regenfälle welche während der Regenzeit regelmäßig zu Katastrophen führen. Dieser Blog informiert über letztere. Réduction des risques liés aux inondations : 41 balises implantées dans 12 préfectures par la Croix-Rouge. Distribution de non-vivres : La Croix-Rouge allemande et togolaise au chevet des sinistrés de Tokpli sur togoenvogue.com. Les inondations en Afrique, ne pas reconstruire la pauvreté via Les inondations en Afrique, ne pas reconstruire la pauvreté | End Poverty. République Togolaise – Nouveau bilan des inondations. 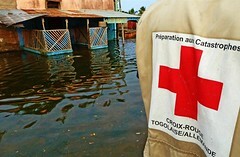 Togo: Floods DREF operation n° MDRTG003. ReliefWeb » Document » Des inondations dévastatrices en Afrique de l’Ouest et centrale. 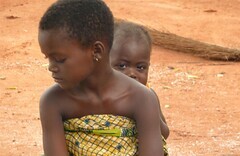 cliquez ici: AfricaAdapt Home page. 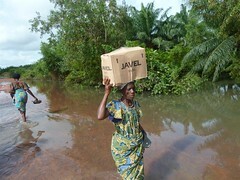 Wanna stay informed on news and actions relating floods in West Africa? Enter your email-address and you will be regularly updated! Sylvio Combey's Blog Blog of a journalist on events in Togo. IFRC Climate Centre supports the Red Cross and Red Crescent Movement to understand and address the humanitarian consequences of climate change and extreme weather events. IFRC ProVention Consortium provides a forum for dialogue and for catalysing new ideas and initiatives on disaster risk reduction. PreventionWeb informs the disaster reduction community. International Strategy for Disaster Risk Reduction (UNISDR ) – the organization overseeing the development of disaster reduction policy. Earthquake and Megacities Initiative (EMI) offers online courses on disaster risk reduction. Reliefweb's Site on the 2010 floods in West Africa / ReliefWebs Seite zu den Überschwemmungen in Westafrika 2010 informs about the 2010 Floods in some West African countries. The International Disaster Database (EM-DAT) provides an objective basis for vulnerability assessment and rational decision-making in disaster situations. Inter Agency Standing Committee (IASC) is the primary mechanism for inter-agency coordination of humanitarian assistance. It is a unique forum involving the major International Humanitarian Non-Governmental Aid Agencies, the Red Cross and the humanitarian organizations of the UN. European Commission Humanitarian Aid Office (ECHO) is one of the world’s main humanitarian aid donors. ECHO disperses around 800.000€ in aid annually. This site has no copyright on the published material. All content belongs to the original publisher.